DJET SET DE FALGAS IS SOLD! Many Congratulations and thanks to Khalfan Hamad Al Qubaisi of Abu Dhabi. We look forward to the contributions DJET SET DE FALGAS will make in the UAE. PLEASE SEE OUR HOMEPAGE FOR UPDATES ON HIS PROGENY AVAILABLE AT OUR FARM IN TEXAS. 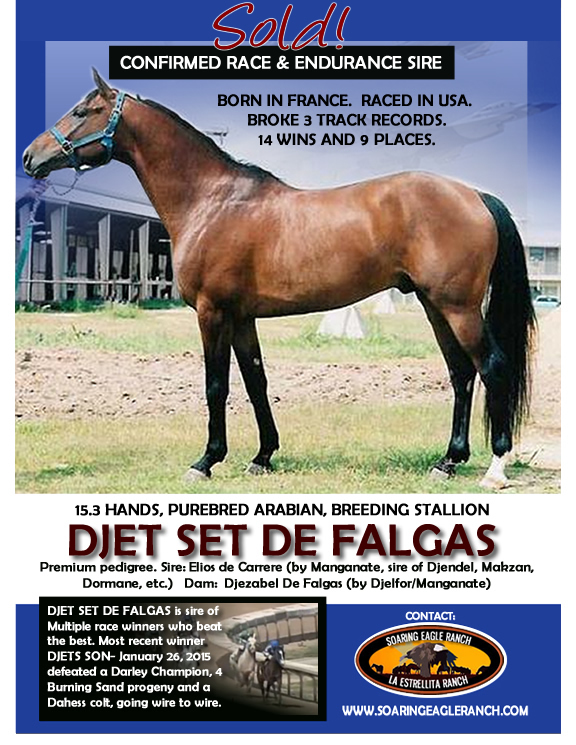 Retired from Racing in 2009 at age 8, Djet Set De Falgas ran an outstanding last year of racing. Having 5 starts and 5 wins in 11 weeks, Djet Set De Falgas ran and he broke three track records, at 6 F, 1 mile, and 1 1/8 mile. Included in these 5 wins were two stake races, The COBRA Sprint at 6 furlongs and Rocky Mountain Arabian Cup at 1 1/8 mile. As a junior sire, DJET SET has performed spectacularly. He stamps every foal consistently with his conformation and abilities. They are tall, athletic and they perform. He has produced no culls- every foal we have produced from him at Soaring Eagle Ranch has gone to the track to race. His winners include: Ebeaucoup, Efondue, Djet Propelled, Belle Lorena, Eet Cetera, Etres Chic, Djets Tigress, Chere Bebe, Djets Son, and Djetset Go. Some of his other notable winners include Hy Hopes JPL, and Maseratti CS and Fantasia CS- winners in Qatar. In 2014 he had 9 starters and these successful foals launched him to the top 10 leading sires in USA, ahead of Line Dancer, Chndaka and Madjani. 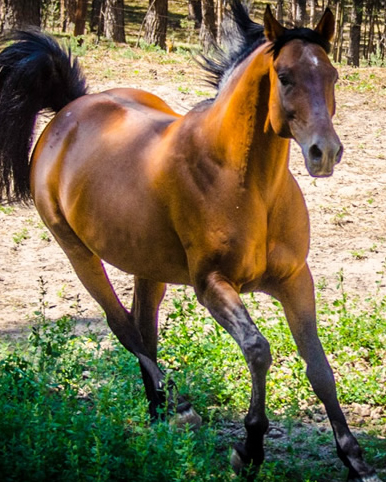 He produces sound and solid offspring, and is now seeing his oldest foals also move into the endurance world with success. Always a thrill with DJET SET DE FALGAS! DJET SET' ran consistently and soundly his entire career against top company. Only off the board twice in his 33 starts, he won 14 races lifetime with 6 seconds and three thirds, 4 stakes wins and 6 stakes placings. In his final year of racing at age 8, he had 5 starts and 5 wins in 11 weeks... and he broke three track records, at 6 F, 1 mile, and 1 1/8 mile. DJET SET DE FALGAS is the jewel of our Select Package Offering, Click here for details.